Are you looking for a career that will allow you to care for others? Then you can consider a career as a vocational nurse. Wanting to care for others is only just the beginning; doing a job such as this one will require you to be a person who possesses several other traits. What does a vocational nurse do? Before making the solid decision that this is the path you want to follow. 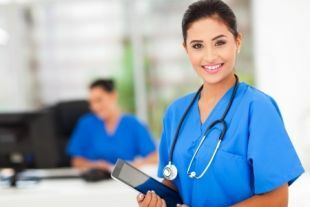 The duties of a vocational nurse, sometimes known as a licensed vocational nurse (LVN), can vary depending on the institution at which they work. Environments in which these types of nurses work include health and medical facilities, nursing homes, clinics, hospitals and private homes. These professionals generally work under the guidance of a doctor, registered nurse or physician’s assistant. 1 Briefly, What does a Vocational Nurse do? Briefly, What does a Vocational Nurse do? In short, the work of a vocational nurse depends on the facility where they work. The duties include the provision of medical comfort to patients. They also ensure that patients seeing a doctor in a medical facility are properly cared for. Such professionals attend to tasks such as welcoming patients to the facility, checking important statistics, talking with other nurses and doctors to keep them up to date about patients, changing bandages, assisting patients to clean themselves and also get dressed. Vocational nurses can do other things apart from the ones stated above. What they can do and not do, in most cases, is legislated by the state in which they work. Even though there are basic duties that every vocational nurse should be able to do, what they eventually do depends on the type of institution at which they work in. In nursing homes and facilities that offer extended care. They spend most of their time providing care to the elderly and the chronically ill. In such settings, nurses have the ability to build long-term relationships with patients. This is why they are generally able to provide useful information to other caregivers about the patient’s condition. They can also offer suggestions when a patient moves from one care facility to another. Licensed vocational nurses also get employed in hospitals to assist with the collection of important information such as respiration, pulse, blood pressure and temperature. In hospitals, the duties extend to the administration of enemas and injections, giving alcohol or massage rubs, and monitoring catheters. It is also common that you will find vocational nurses in hospitals bathing and dressing patients who lack the ability to do this for themselves. They also apply ice packs, hot water bottles, and dressings. The collection of soiled bed sheets and helping patients move sides so that they do not have bed sores is an important part of the vocational nurse’s job description. Additional tasks in this job also involve watching patients so that they can report in time when... ...there are complications with treatment. Depending on the state, these nurses can also administer medicine. They collect samples for tests. When doctors are performing complicated medical procedures these nurses can help. It is common to find a vocational nurse assisting in the delivery of babies in a maternity ward. They can also assist with caring for new infants and sometimes feed them where the need arises. You can expect anywhere between $31,000 to $68,350. Most of the vocational nurses are somewhere around the average which is around $45,500 in 2019. 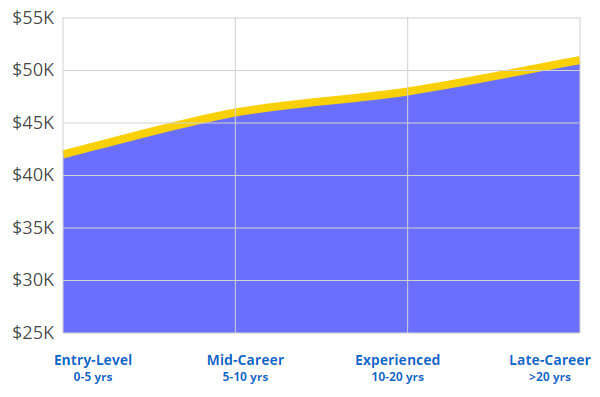 Just like in most professions your salary will go up with seniority. * The data is based of ~7,800 vocational nurses salaries in 2019. In order for a vocational nurse to be able to do her work, she needs certain skills and character traits. Vocational nurses have to be physically fit. Otherwise, how can you expect to take care of others when you are not in the best of health yourself? The job involves a lot of walking and standing. Sometimes the distances such nurses walk look like they are short, but if put together you will realize that the nurse walks a considerable distance per day. Vocational nurses work with people when they are at their weakest in life. This is the reason why compassion is a fundamental requirement for someone who does this kind of work. People who arrive in hospitals and other medical facilities can be in great pain, confused, or sick and need someone who will understand their condition. People in this state require all the kindness they can get. The medical field is one of the places where a mistake can result in the death of a patient. For example, if the nurse does not pay enough attention to detail, she may give the wrong medication to the wrong patient. If a patient dies and it’s because someone in the hospital didn’t pay attention and made a mistake the consequences can be quite dire, other than the fact that the patient died, there’s most likely going to be a medical malpractice law suit filed against the hospital. The job of a Vocational Nurse involves dealing with people on a daily basis. The nurse has to understand that people are different and cannot be treated with a “one fits all” attitude. The nurse needs to be personable. She needs to be able to speak clearly. Whether a patient will take their medication according to prescription depends on the clarity of the instructions given by the nurse. Being a good listener is also a part of the job. Patience is also another trait that every vocational nurse should have. Patients who are ill or in pain can be quite difficult to handle. Patience leads to understanding which is exactly what patients in this condition are looking for. The work of a vocational nurse can be a demanding one. If you are planning to take up a role in this profession, you may want to consider the reasons why this could be a career you want to follow. For those who have the right disposition and character traits, there are several career paths available in this field. With the right attitude and training, you can be an important part of a team that helps others to feel better. Now that you have an idea of what vocational nurses do, you can make a more informed decision. I am absolutely fascinated with the medical field, of all careers I wouldn’t ask for any other job, i would be so happy! Helping others is first nature to me and I’m sure the patients would more than appreciate that. If I may get an opportunity at a vocational nurse position i would be overjoyed and proud that this will eventually be my career. I’m glad to hear that, the US is short of people like you who wants to work in the medical field, maybe you should go for it? Good luck!